The Doel-e(a)t-Art sweet is a stylized and abstract praline designed by a confectioner with Antwerp roots representing the Earth globe. The praline has a light blue filling representing water. The tiny blue spot on the outside refers to the “globalizing” village of Doel, a former polder village that is now situated right in the middle of the international port of Antwerp and is threatened with demolition. The praline is produced in two versions (black/white). The black version, which has still the colour of the earth, is closer to the old rural Doel; the white version refers to the economically globalizing world that has deprived Doel of its rural nature. Some pralines have been cut in half and the cross section is finished with a light blue chocolate, thus allowing consumers to assemble their own praline by slightly heating up the blue chocolate with their finger and sticking two halves together. By allowing consumers to join a black and white half, the Doel Arts Village team wants to convey the message that the globalizing port of Antwerp and Doel arts village are not mutually exclusive, but that they can coexist in perfect harmony. At the general level, the two-coloured version represents cooperation between all peoples and cultures, regardless of their location on the globe and the colour of their skins. Concept submitted by: Doel Arts Village team. Coating: white and plain chocolate, pinch of light blue chocolate to refer to the filling. - Gradually add the sugar syrup to the butter while stirring until you achieve creamy mixture. - Optional: add pinch of sugar according to taste. - Take a traditional round-shaped truffle mould (Æ 2.8 cm); first apply the blue spot, then the marble nerves as shown on the picture. - Mould the white or plain chocolate. - Fill with blue truffle cream. 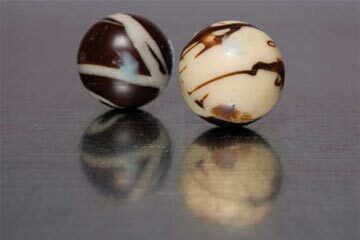 - Either join the two halves to obtain the spherical shape, or finish off the cross section with blue chocolate to obtain the half-truffle version. Eva Van Tulden (Antwerp) graduated at a local art academy and is currently studying philosophy at Antwerp University. Last year, she developed an art project in Doel together with a local artist and launched a petition asking the authorities to maintain Doel as an arts village. Frie Lauwers has been living in Doel for three years and is so upset about the abominable situation of the village that she has turned into a real Doel "Pasionaria." Frank Arts is a local businessman (Beveren) who will help us promote the Doel-Antwerp reconciliatory praline. 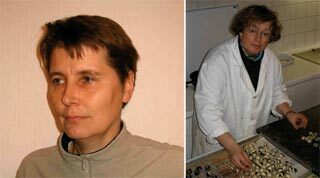 Els Van Vlimmeren is a chocolate designer who runs a small-scale shop in Zoersel, a village 20 km outside Antwerp. Els and Eva are former school friends.